TREET ADDRESS Fiji Rugby Union 35 Gordon Street Suva Fiji Islands. POSTAL ADDRESS PO Box 1234, Suva, Fiji. The Fiji national rugby union team is the men’s representative side of Fiji in rugby union. Despite the relatively small size of their represented country, in the 2007 Rugby World Cup Fiji defeated Wales 38–34 to claim a quarter final spot (theoretically placing them in the top 8 teams in the world) and proceeded to give eventual winners South Africa a scare eventually going down 37–20. Fiji is one of the few countries where rugby union is the main sport. There are approximately 80,000 registered players from a total population of around 950,000. One of the problems for Fiji is simply getting their players to play for the country as many have contracts in Europe or with Super Rugby teams where the money is far more rewarding. The repatriated salaries of its overseas stars have become an important part of some local economies. In addition a significant number of players eligible to play for Fiji end up representing Australia or New Zealand; two notable examples are the Fiji-born, but New Zealand-raised, cousins and All Blacks Joe Rokocoko and Sitiveni Sivivatu and Wallabies Wing Lote Tuqiri. Fiji has won the most Pacific Tri-Nations Championships of the three participating teams. The cibi (pronounced [ˈðimbi]) war dance is performed by the Fiji rugby team before each Test match. It has been used on the rugby field since 1939, though its origins date back to the country’s warring times with its Pacific neighbours. Fiji presenting Cibi before 2011 Rugby World Cup match against South Africa. Rugby was first played in Fiji by European and Fijian soldiers of the Native Constabulary at Ba, on Viti Levu Island in 1884. In 1913 a Union was founded for the European settlers. In December 1913, the All Blacks, who had been touring so very successfully in California, were on their way back to New Zealand. The Fiji RFU arranged a game with them at Albert Park, the first representative match to be played in the colony. The Fiji team were Europeans. 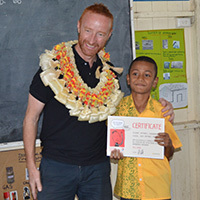 The All Blacks won 67–3; Fiji’s points came from a try scored by their captain and coach, PJ Sheehan. By 1914 a ‘native competition’ was started and in 1915 a Fiji Native Union was begun and became affiliated to the Fiji RFU. Fiji played their first international against Western Samoa in Apia, Samoa on 18 August 1924. Fiji’s 20-man squad came exclusively from the five registered native clubs of the time. The match was played at 7 am to allow the Samoans time to get to work afterwards and was played on a pitch with a large tree on the halfway line. Fiji wore black and won 6–0 despite playing barefoot. The return match was won 9–3 by Samoa to draw the series. The first-ever Fiji test team continued their overseas adventure with a nine-match tour of Tonga. 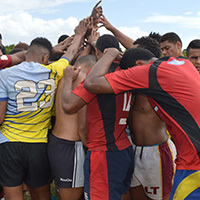 Though Fiji lost the first test played in Nukuʻalofa 9–6, they were not to lose again, taking the second test 14–3 then drawing the decider 0–0. They won all six of the matches against non-test opposition. Auckland University College were the first overseas side to visit Fiji in 1926, The Kiwi students played the Fiji Europeans and finished the three-match series with a win, loss and draw. Tonga also visited Fiji that year and for the first time Fiji played in their present strip of white jersey, palm tree badge and black shorts. The three match series finished level with Tonga winning the first test 9–6; Fiji winning the second 14–3 and the final game a 0–0 draw. During the 1927 season, a General Meeting was called for the purpose of arranging a return visit to New Zealand at the invitation of Auckland University. Some 30 players expressed their willingness to make the trip, but after all arrangements had been made, there were insufficient players available so management cancelled the trip, much to the regret of Auckland. The first New Zealand Māori team to visit Fiji came in 1938. 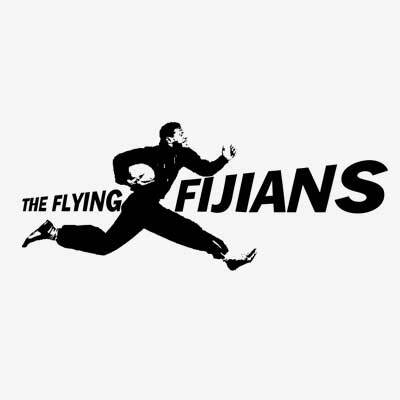 Fijians played in boots for the first time but there was still a tendency to take off boots during the match and throw them to the touch-line. On the five-match tour, the Māori beat Fiji 2nd XV and Fiji Europeans before playing a three match series. The first test ended in a 3–3 draw, the second an 11–5 win for the Fijians and the Māori won the final test 6–3 to square the series. In 1939 Fiji toured New Zealand for the first time. Fiji’s captain for that tour, Ratu Sir George Cakobau, decided that his side should have a war dance to rival the haka. He approached Ratu Bola, the high chief of the warrior clan of Navusaradave in Bau, who taught them the cibi which has been Fiji’s pre-match ritual ever since. With many players still preferring to play barefoot, the Fijians played with a care-free spirit and created history by becoming the first team to go through a full tour of New Zealand unbeaten, winning seven and drawing one, a record that stands to this day. They played and beat the Māori again 14–4. Fiji successfully toured New Zealand again in 1951. They beat the New Zealand Māori 21–14. Fiji’s first tour of Australia helped the Australian Rugby Union recover from the brink of bankruptcy in 1952. The Test series was drawn 1–1 in front of record crowds. Australia won the first test 15–9 but the Fijians took the second with a 17–15 win. A second tour of Australia took place in 1954 and again drew record crowds. Again Australia won the first test but only by 22–19. The test series was drawn 1–1 after Fiji won the second test 18–16. The same year Fiji played host to Western Samoa. Fiji toured New Zealand again in 1957 and beat the Māoris 36–13 in Dunedin and 17–8 in Wellington, then defeated a strong Auckland team 38–17. In 1964 Fiji toured Europe for the first time, they played five memorable games in Wales, culminating in a classic encounter in Cardiff that was talked about for years. Wales won 28–22 but conceded six tries for just the second time in their history. In 1970 a rampant Fijian side destroyed the Barbarians 29–9 at Gosforth. A last-minute try saw New Zealand safely through 14–13 over Fiji in Suva in 1974. In August 1977 the British Lions made a stopover in Fiji on the way home from their tour of New Zealand. Fiji beat them 25–21 at Buckhurst Park, Suva. In 1982 Fiji beat Vancouver XV to begin a 15-match winning streak through to 1984. Fiji played their first full test against Wales in Cardiff in 1985, the home pack dominating in a 40–3 win with two tries to Phil Davies. 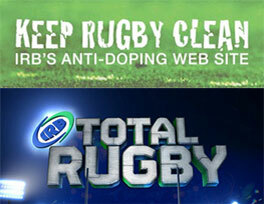 Fiji were also heavily beaten by Llanelli and Cardiff, but lost by just one point in their test with Ireland. Wales visited Suva the following year, where captain Dai Pickering’s summer tour was to a premature end when he suffered concussion. Richard Moriarty took over and saw his side’s 13–0 lead cut to a single point before Wales pulled away for a 15–22 win. In 1991 Rugby World Cup Fiji lost all three of its matches and finished bottom of its pool. Wales’ third test win over Fiji came in Suva in 1994. The tourists fielded a weakened line-up to allow all their squad a game, but they were good enough to run out 23–8 victors. Fiji had a troubled tour of Wales and Ireland in 1995, losing six of nine games with defeat to Neath, Cardiff and Pontypridd. However, they managed to run Wales close at the Arms Park, losing only 15–19 win. They failed to qualify for the 1995 World Cup having lost to Tonga and Western Samoa. Fiji rebuilt ahead of the 1999 World Cup, new coach Brad Johnstone instilling discipline and determination into their set-piece play. They made a winning start by beating Canada and Namibia and again seemed about to beat France in Toulouse when things went wrong. A controversial refereeing performance from Paddy O’Brien was felt to have cost them a win over France, Fiji losing 28–19. They did make the quarter-final play-off but lost 45–24 to England at Twickenham. Soon after the tournament Johnstone departed for Italy. In 2001 Fiji were crowned Pacific Rim champions, defeating Samoa 28–17 in the final in Tokyo. Fiji’s played Wales again at the Millennium Stadium in November 2002. Two tries and 21 points from the boot of Stephen Jones helped the home side to a comfortable 58–14 win. Fiji began their 2003 Rugby World Cup qualifying campaign in June 2002 when the three leading Pacific Island nations faced each other in a round robin in the second round of the Oceania zone qualifiers. The Fijians started with defeats of Samoa and Tonga, but their loss to Samoa on home soil meant that they had to beat Tonga by more than 20 points to finish top of the pool. This they duly did with a 47–20 win in Nadi. At the World Cup they beat Japan 41–13 and narrowly survived a scare against the US Eagles winning 19–18. However a 20–22 loss against Scotland and an 18–61 beating by France saw them finish third in their pool and fail to qualify for the knock-out stage. Results since have been mixed for Fiji. Although they have traditionally been the strongest of the Pacific Nations, they were beaten 29–27 by New Zealand Maori in 2004 and went down 91–0 by the All Blacks. In July 2006, five Fiji internationals were banned from playing international rugby for the rest of the year following a drunken brawl in Japan after a Pacific Five Nations match. Their 2007 season started off as one of Fiji’s worst seasons. They had a very inexperienced team and lost to both pacific rivals Tonga and Samoa, and suffered heavy defeats to Australia and the Junior All Blacks. The only win for Fiji at the 2007 “Pacific 6 Nations” was against Japan, however they did manage an unexpected 14–14 draw against Australia A. With most of Fiji’s more experienced players back in the team Fiji slowly improved in the 2007 world cup to qualify for the quarter finals for the first time in 20 years. Fiji were placed in Pool B of the 2007 Rugby World Cup along with Wales, Canada, Japan and Australia. After beating Japan and Canada in close matches, Fiji rested several key players against Australia for the crucial game against Wales. Australia defeated Fiji by 55–12. 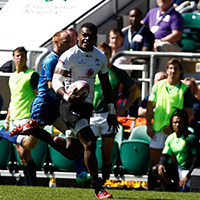 Fiji’s fate in the tournament came down to a “winner advances” game against Wales which Fiji won 38–34 and qualified for the quarter-finals for the second time. Former Wallaby great Michael Lynagh described the see-sawing match as one of the best matches “of all time”. Fiji lost their quarter final match against South Africa, however their above expectations performance in the tournament resulted in them moving up to 9th in the world rankings – their highest ever position. Shannon Fraser and Gregg Mumm from Australia acted as assistant coaches for the period leading up to the world cup and were accredited for much of the Fijians sides success.